Scholarly research can be a wonderful thing. It can connect the dots between seemingly diverse topics and reveal relationships that are not obvious to the casual observer. An astute researcher can zero in on such relationships and peel away their various layers for comparison and examination. Mr. Kabatchnik has published a series of books examining stage productions for each quarter century from 1900 to 2000. In doing so he has secured a unique niche among theater historians. In order to fall under the author’s purview, a theater piece has to revolve around some level of crime. He analyzes artistic works of murder, savagery, stealing, deception, political conspiracy, spying, and more. Mr. Kabatchnik’s study is far from a mere list of plays and plots. He gives an historical background for his bloody theme reaching back into the earliest annals of drama. In ancient Greece, we learn, Aeschylus helped get the ball rolling by depicting the mythical god Zeus as a vengeful mass murderer in the play Prometheus Bound in 479 BCE. The author’s research follows that river of theatrical blood all the way to our modern day stages. It is almost impossible to dip into the thick (646 page) volume without catching some of the author’s passion for his material. Each of the 80 plays in the book is given an essay placing the work in a context helping to anchor it to the atmosphere of its time. We learn about the playwright’s background, the play’s production, and the impact of the work on both critics and audiences. There are comparisons with theatrical works in the genre and with historical works that have resonances with the work under scrutiny. The author reports on the reactions of critics when the plays opened and provides excerpts from analytical articles. Lines of dialogue and descriptions of sets, costumes, and characters enhance a number of his essays. If this all sounds dry and academic, guess again. Mr. Kabatchnik is an unabashed academe, but he is far from boring. Just as the playwrights in Mr. Kabatchnik’s thorough study drop enticing clues for their detective characters—and eventually their audiences—to follow, the author leaves a trail of appealing informational tidbits that draw the reader forward from insight to insight. 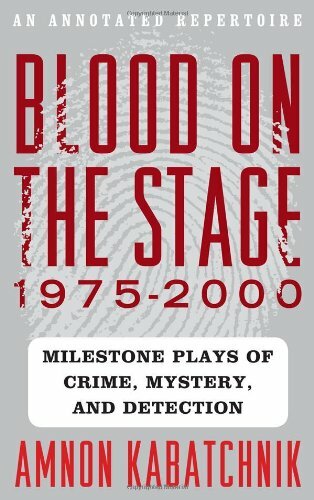 Blood on the Stage, 1975–2000: Milestone Plays of Crime, Mystery and Detection is entertaining material for theater lovers, and a potentially valuable resource to theater historians and those interested in the sociological ambiance reflected in the theatrical productions of our times.